The Windows Phone 8 SDK provides Windows Phone Emulators which can be used by the developers to run their Windows Phone app on Emulator from Visual Studio or deploy the app on the emulator with the help of the application deployment tool. To run the App in the emulator, hit F5 shortcut key from the WP8 Project in Visual Studio 2012. This will pick up the default emulator for WP8 and run your app on it. The Windows Phone 8 SDK provides 3 additional WP8 Emulators for the developers to test their app. 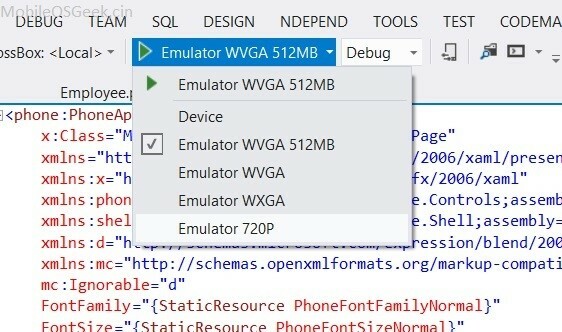 Note that if you have a developer unlocked Windows Phone 8 device plugged into your computer, you will be able to run the application directly on to the device by selecting the “device” from the DropDownList shown above.